The birth of the Smithsonian Institution can be traced to the acceptance of James Smithson's legacy, willed to the United States in 1826. Smithson died in 1829, and in 1836, President Andrew Jackson informed Congress of the gift, which it accepted. In 1838, Smithson's legacy, which totaled more than $500,000, was delivered to the United States Mint and entered the Treasury. 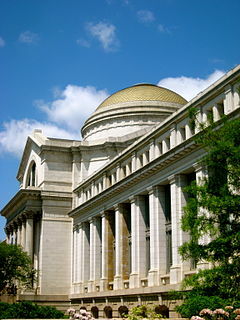 After eight years, in 1846, the Smithsonian Institution was established. The Smithsonian Institution Building (also known as "The Castle") was completed in 1855 to house an art gallery, a library, a chemical laboratory, lecture halls, museum galleries, and offices. During this time the Smithsonian was a learning institution concerned mainly with enhancing science and less interested in being a museum. Under the second secretary, Spencer Fullerton Baird, the Smithsonian turned into a full-fledged museum, mostly through the acquisition of 60 boxcars worth of displays from the Centennial Exposition in Philadelphia. The income from the exhibition of these artifacts allowed for the construction of the National Museum, which is now known as the Arts and Industries Building. This structure was opened in 1881 to provide the Smithsonian with its first proper facility for public display of the growing collections. The Institution grew slowly until 1964 when Sidney Dillon Ripley became secretary. Ripley managed to expand the institution by eight museums and increased admission from 10.8 million to 30 million people a year. This period included the greatest and most rapid growth for the Smithsonian, and it continued until Ripley's resignation in 1984. Since the completion of the Arts and Industries Building, the Smithsonian has expanded to twenty separate museums with roughly 137 million objects in their collections, including works of art, natural specimens, and cultural artifacts. The Smithsonian museums are visited by over 25 million people every year. Eleven of the 19 Smithsonian Institution museums and galleries are at the National Mall in Washington D.C., the open-area national park in Washington, D.C. running between the Lincoln Memorial and the United States Capitol, with the Washington Monument providing a division slightly west of the center. Five other Smithsonian museums and the National Zoo are located elsewhere in Washington. Two more Smithsonian museums are located in New York City and one is located in Chantilly, Virginia. The Smithsonian also holds close ties with 171 museums in 41 states, as well as Panama and Puerto Rico. These museums are known as Smithsonian Affiliates. 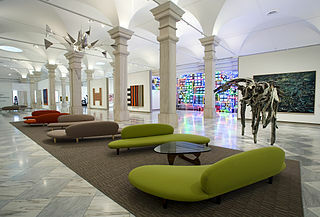 Collections of artifacts are given to these museums in the form of long-term loans from the Smithsonian. These long-term loans are not the only Smithsonian exhibits outside the Smithsonian museums. The Smithsonian also has a large number of traveling exhibitions. Each year more than 50 exhibitions travel to hundreds of cities and towns all across the United States. African American culture Washington, D.C.
Re-Opened May–June 2016 as a special events venue. Washington, D.C. Contemporary and modern art Washington, D.C.
Aviation and spaceflight history Washington, D.C.
African-American history and culture Washington, D.C. Native American history and art Washington, D.C.
United States Postal Service; postal history; philately Washington, D.C.
American craft and decorative arts Washington, D.C. Visitor center and offices Washington, D.C.
A satellite image of the eastern half of the National Mall with 10 Smithsonian museums located on it. On the northern side of the Mall are the National Museum of American History (2) and the National Museum of Natural History (3). 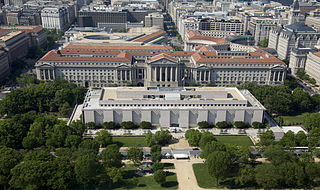 On the southern side are the National Museum of the American Indian (10), the National Air and Space Museum (11), Hirshhorn Museum and Sculpture Garden (12), Arts and Industries Building (13), Smithsonian Institution Building (The Castle) (14), Freer Gallery of Art (15), Arthur M. Sackler Gallery (16), and the National Museum of African Art (17). The National Museum of African American History and Culture is built on the plot of land to the west of the National Museum of American History (2). Other landmarks shown in this image include the Washington Monument (1), the National Gallery of Art's Sculpture Garden (4), West Building (5), and East Building (6), the United States Capitol (7), the Ulysses S. Grant Memorial (8), and the United States Botanic Garden (9). ^ a b Arts and Industries Building. The Smithsonian Institution. Retrieved December 26, 2015. ^ a b Brenson, Michael (September 8, 1987). "Beneath Smithsonian, Debut for 2 Museums". The New York Times. Retrieved December 29, 2009. Spencer Fullerton Baird was an American naturalist, ornithologist, ichthyologist, herpetologist, and museum curator. Baird was the first curator to be named at the Smithsonian Institution. 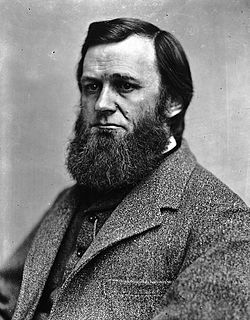 He would eventually serve as assistant Secretary of the Smithsonian from 1850 to 1878, and as Secretary from 1878 until 1887. He was dedicated to expanding the natural history collections of the Smithsonian which he increased from 6,000 specimens in 1850 to over 2 million by the time of his death. He published over 1,000 works during his lifetime. The Corcoran School of the Arts and Design, established in 1878, is an art and design school in Washington, D.C., United States. 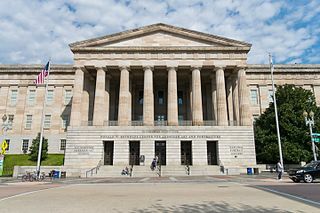 In 2014, the formerly independent college and the Corcoran Gallery of Art closed, with school operations being assumed by the George Washington University (GWU), and the gallery collection given free to the National Gallery of Art.